The term, ‘flats’, means lots of things to lots of different anglers. Bonefishers love to sight fish over stretches of shin-deep, pure white sand or marl. Tarpon enthusiasts often find their prey on ‘flats’ that are six to eight feet deep, and everyone knows that redfish prefer shallows where the rough, rocky bottom holds crustaceans and other of their favorite foods. Even die-hard offshore ‘diggers’ look for flat-bottomed ‘prairies’ where occasional rock outcroppings and ledges create a hiding place for grouper and snapper. But on our Big Bend, particularly in the fall, when we think of flats we think of vast expanses of healthy turtle grass, crystal clear water–and spotted sea trout. 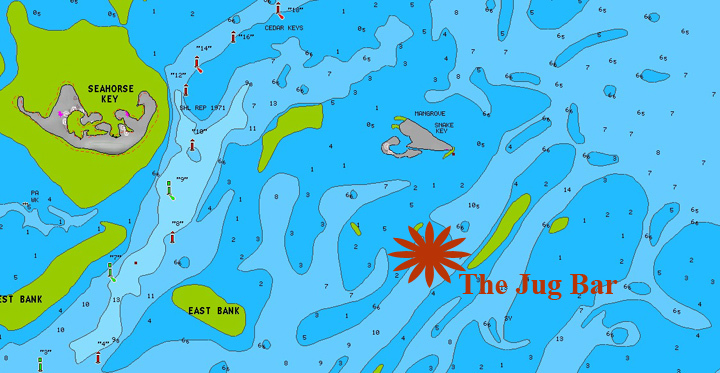 And two of the best flats to fish are Cedar Key’s Jug Bar and those near the ruins of the bird rack offshore of Big Grass Island, between Steinhatchee and Keaton Beach. The Jug Bar, likely named that because someone once marked some part of it with a tethered jug or bottle, is a shallow bank located south of Snake Key, one of the smaller Cedar Keys. It’s best approached by running down the Main Ship Channel from the village of Cedar Key to marker #4 and then making an easterly turn, avoiding the shallow southern tip of East Bank (N29 04.665 W83 03.108) . From there, you’re pretty much in the middle of a shallow grassy flat that’s about 3 miles square, running from Snake Key south to the deeper Gulf waters and east to west from Waccasassa Bay to the Main Ship Channel. The distinguishing feature of this area is that it’s cut through in many places by deep sloughs and swashes. The grassy edges of these deep cuts make perfect hunting grounds for ambush feeders such as sea trout, the area’s most popular and abundant game fish. Shrimp and pinfish are probably the most prevalent bait species found here during the late summer and early fall, and both make excellent choices for anglers who prefer fishing with live bait. However, with the undulating bottom at the Jug Bar, it’s difficult to keep live baits at a consistent depth using popular popping cork rigs, which work fine at more constant depths. Options include free-lining live baits, lightly weighted with a small split shot sinker, or tossing a man-made look-alike. A 3-inch D.O.A. shrimp (nite glow or holographic glitter) or one of MirrOlure’s Paul Brown Devils (glow or bone), dragged slowly down a cut or across the grass tops, head my list of ‘go-to’ artificial lures here, especially as the water temperatures fall later in October. Before I explain why the fishing’s so good on the flats around the bird rack north of Steinhatchee, I probably should address the question, “What’s a bird rack?” What follows is probably more than you’d ever want to know. According to an indisputable source (my Dad) who grew up in Tarpon Springs during the 1930’s, there was a cottage industry there based on the collection and sale of sea bird guano (droppings) as fertilizer. To attract the birds and their business, a series of roosting platforms, about 20-feet square, were built along the Gulf coast from Pasco to Taylor Counties. Most were constructed near the edge of the one-fathom (6-foot) contour, allowing towed collection barges access to them on most tides. The summer job of scraping bird racks was not fun for high-school boys, but in those times–a job was a job. During World War Two, pilots home from the European theater and temporarily based in St. Pete and Cross City, found the structures handy targets for bombing and strafing practice. Now, just a few, mostly ruins or just a few pilings, still stand, including the one southeast of Big Grass Island, between Steinhatchee and Keaton Beach at N29 43.438 W83 34.373. Unlike the Jug Bar, the flat surrounding this ruin is deep, and although peppered with sand holes rather than cuts, depths are more consistent, in the 5 to 7-foot range. Here, the ever-popular popping cork rigged with a light jig head and shrimp–or a solo shrimp imitation– works well. Just remember to rig so the working end of your rig drifts slightly above the grass tops. Non-shrimp bait options include pinfish or noisy pigfish, usually available at local marinas and bait shops. Artificial bait enthusiasts should also consider retrieving the ever-popular MirrOlure 52M18 or D.O.A. Lures’ Deep Runner Bait Buster in the pearl/green/red (#372) configuration across any sandy spot seen while making a slow drift of the flat. Reaching this flat isn’t particularly difficult. On a moderate tide, plot a course from Steinhatchee River marker #5 at about 300-degrees (true) and run about 7.5 nautical miles to the bird rack. It’s easily seen from several miles away on a clear day. On extremely low tides, and depending on your boat’s draft, cheat your course a bit more westerly to stay away from the shallow sand bars off of Dallus Creek, near N29 41.372 W83 30.934. Spotted sea trout are not the only species you’re likely to find on these flats in October. Spanish mackerel, bluefish and cobia often continue to feed in these areas well into the month. With that in mind, it’s worthwhile to keep an eye peeled for birds wheeling over striking mackerel or blues—or for the dark silhouette of a big cobia checking out your boat. A stout spinning rod, rigged and ready with a light-but-sturdy leader and a snap will allow you to quickly change your terminal tackle from a shiny spoon (for mackerel and blues) to an eel imitation (for cobia). I use a pre-made Liquid Steel 12#, 27-inch leader on my ‘standby’ rods, and believe me, when hungry fish are in the mood to eat, these almost-invisible steel leaders won’t keep them from biting. Yes, anglers do lots of ‘flats fishing’ along the Big Bend. But unlike flats found at other parts of the state, they’re deep, grassy and often extend miles in many directions, bounded only by river channels and the edge of the Continental Shelf itself. And if the two I’ve described are not to your liking or too far out of the way, it’s as simple as asking directions at any local Big Bend marina or tackle shop as to the location of another similar spot. We’ve got hundreds!